As 2017 rapidly winds down, we can soon expect to hear rampant conversations regarding new year’s resolutions. Every year, January 1st represents a chance to once again become our best selves. It is a time for reflection of the past and for imagination about the future. Yet despite the hope inspired by a new year, it often remains difficult for many of us to execute the kind of change we most desire. 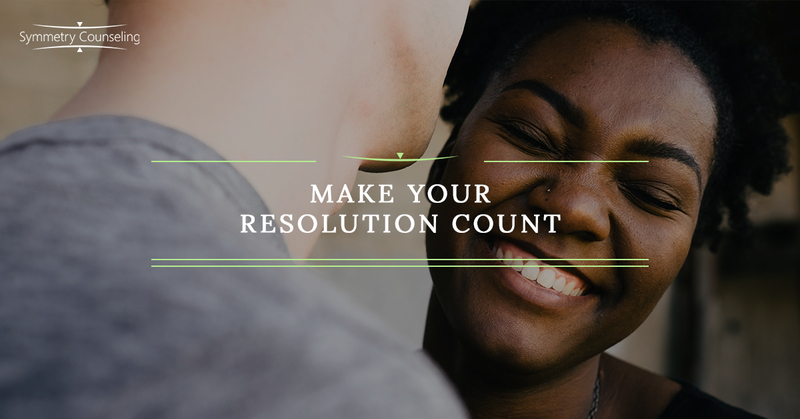 While each case may be unique, there are a few simple ideas that can help bolster your chances of success in fulfilling your 2018 resolution. Pick the right goal. Clarity of vision is perhaps the most crucial aspect in achieving your resolution. You may have several ideas about where to begin in becoming your best self. Yet at this stage, it is best to focus on only one goal at a time to avoid becoming overwhelmed and frustrated with the process. Take some quiet time to check in with yourself and discover which goal generates an emotional response. It may be helpful to break down a larger goal into more manageable, smaller goals. If your goal is to go back to school, for example, some of the initial steps may be to speak with an academic advisor or to begin studying for an entrance exam. The takeaway at this stage is to away your goal from a theoretical realm and into an operational one. A therapist can be extremely helpful at this stage to ensure that your goal is realistic, achievable, and in line with your values. Roll with the resistance. Motivation and buy-in to the change process can be fickle. Any change, even the positive kind, can be stressful and evoke resistance. Therefore it is crucial to plan for moments when you may ready to throw in the towel or when you find your behavior beginning to slip. Working with a therapist to identify what has and has not worked in the past can help to anticipate future obstacles. Many find it helpful to have motivational words or images on hand, such as stored on your phone or taped to a mirror at home. If you have broken down a larger goal into smaller parts (which is highly recommended), try to institute realistic “rewards” for your successes. For each increment of debt reduced, for instance, give yourself an at-home spa day with homemade products. For some, rewards may not have as strong an impact as potential short-term negative consequences. If 2018 is the year for you to give up nicotine, pay a roommate or a coworker ten dollars for each cigarette smoked. Find your support. We do not thrive in isolation. Even the most introverted among us need community in order to foster growth in the change process. This is one of the fundamental benefits to 12-step programs such as Alcoholics Anonymous (AA) and Overeaters Anonymous (OA). Recruit someone to be on your team to serve as a cheerleader, an accountability partner, and a sounding board. Pick someone with whom you can be totally honest both about the triumphs and about the setbacks. This person should demonstrate that they support to your vision of the future and a commitment to holding you accountable. This often includes both professional and peer support since they often serve different, yet equally important, roles. Remember that change is not an easy process. Whatever behavior you are working to address likely did not emerge overnight and it will take time to mold it in a healthier direction. While it is healthy to set realistic expectations for behavior, it is important to practice patience regarding your thoughts and feelings. Often to generate truly lasting change we must go through a phase of taking desired actions while still harboring mixed feelings about the process itself. Let one of our therapists help get your 2018 off to its best start today!